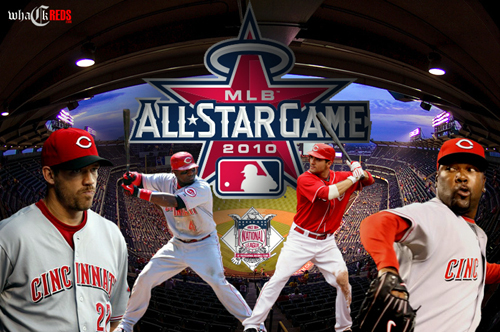 THE CINCINNATI REDS WILL SEND FOUR PLAYERS TO THE 2010 MLB ALL-STAR GAME IN ANAHEIM, CA. For the first time in six years, the Cincinnati Reds will have multiple players representing them in the MLB All-Star Game. Scott Rolen, Brandon Phillips, Joey Votto, and Arthur Rhodes will be making the trip to Disney's Angel Stadium in Anaheim, CA this year. Since 2004 when the Reds sent Sean Casey, Danny Graves, Ken Griffey Jr., and Barry Larkin; The Reds have only had one player represent them each season in the mid-summer classic (Felipe Lopez in '05, Bronson Arroyo in '06, Ken Griffey Jr. in '07, Edinson Volquez in '08, and Francisco Cordero in '09). Despite being swept by the Phillidelphia Phillies who will be sending three players to the 81st All-Star Game (Chase Utley, Ryan Howard, and Roy Halladay) in a four game series leading up to the break, the Reds remain one game in front of the St. Louis Cardinals in the NL Central after playing ninety games. The 2010 All-Star Game will air Tuesday at 8pm ET on FOX. After beating the Phillies twice in three games at Great American Ballpark to end the month of June, the Reds left for their most arduous road trip of the season; Four games at Wrigley Field, three against the New York Metropolitans, and four at Citizen's Bank Ballpark to face the 2009 National League Champs for the second time in two weeks. The Reds started the trip by slaughtering the Cubs as they took three games and outscored them 30-8 during the series. In New York, the Reds stayed hot taking two games and winning their fifth straight series since they were swept by the Seattle Mariners June 18-20. Despite Johnny Cueto (7IP, 4H, 1ER), Mike Leake (8.1IP, 9H, 5ER), Travis Wood (9IP, 1H, 0ER, 8K), and Matt Maloney (6IP, 4H, 1ER) all pitching well during the series against Philadelphia, the Reds managed to lose all four games. The first three games were tied going into extra innings. The final two games the Reds were shutout 1-0. The prominent highlight of the four game series in Philadelphia was that of Travis Wood taking a perfect game into the ninth inning on Saturday while facing Roy Halladay who completed the feat earlier this season. After Wood allowed a double to Carlos Ruiz leading off the ninth inning, he retired the next three Phillies and sent the game into extras. Logan Ondrusek allowed the game-winning hit in the eleventh, but the run was charged to Bill Bray, as the Reds lost their third straight game in walk-off fashion. During Wood's third major league start, he became the first Red to ever throw nine or more innings of one-hit scoreless ball and not get the win. After the All-Star break, it seems things may get a little easier for the Reds at least through July. Beginning on July 16, the Reds will embark on a seven game home stand against the Colorado Rockies (49-39) and the last place Washington Nationals (39-50). Barring unlikely setback, Stephen Strasburg will face the Reds on Wednesday, July 21. The Reds are then off to Milwaukee (40-49) and Houston (36-53) for three games a piece before ending July back at home against Atlanta.